Dogs Rule, Nonchalantly is an easy book to love. 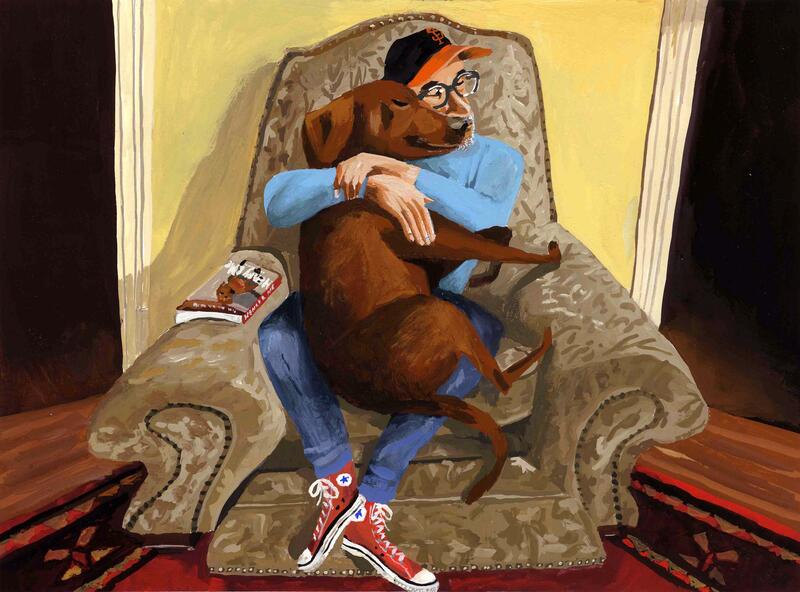 Over the course of 140 pages and 67 paintings of dogs, Mark Ulriksen, author and illustrator, tells us about the dogs in his life and dogs in general. It’s beautiful, it makes you laugh, and it makes you take a moment to be grateful for all of the wonderful dogs in the world that love and tolerate us crazy humans. Beginning with the dedication you’ll find yourself chuckling with the very human and honest details. The dedication’s honesty disarms you and immediately warms you to the story. The story begins with Mark Ulriksen talking about what kind of dog he wanted as a child and why. Next you’ll meet his dogs and then you’ll learn why he’s so impressed with not only his dogs, but all dogs. His tone alternates between refreshingly honest humor and pure love and admiration. It’s charming and enchanting, heartbreaking and heartwarming. You’ll laugh, you’ll get choked up, you’ll laugh some more, you’ll nod along because it is so true, and then you’ll want to read it all over again. Many of the gouache and acrylic paintings have appeared on the covers of major magazines like The New Yorker, The Atlantic Monthly, Bark Magazine, GQ magazine, The Walking Magazine, and O, The Oprah Magazine. Many of the other paintings were either private commissions or personal pieces or for other books. 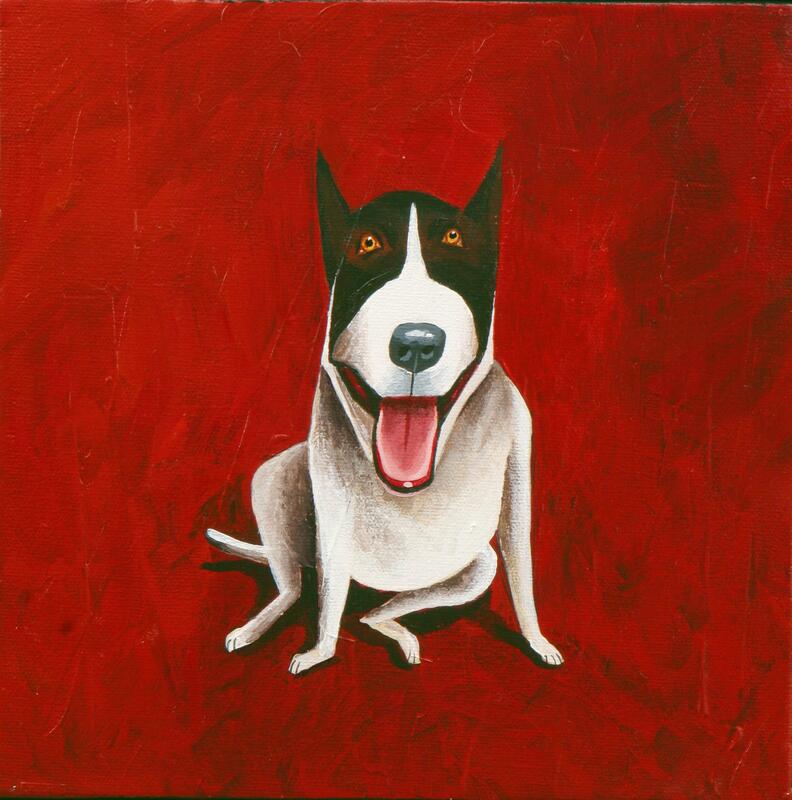 Only about five of the paintings were done specifically for Dogs Rule, Nonchalantly. It’s impressive that paintings done over the course of several years and for many reasons tell such a cohesive and complete story. The paintings themselves are all so happy! The rich, bold, and contrasting colors, smiling dogs and smiling humans, and the many facets of a dog’s life are joyful and enchanting. The tone and the pace of the story is excellently done. At first it seems like a very long read, but once you start reading you’ll see that the text is mainly composed of short sentences that let the illustrations do most of the talking. Really, this book is intended for adults — but it has such universal appeal and honesty to it that anyone of any age can read it and enjoy. To read it is to love it. Roughly all ages. Goff Books. October 2014. 140 pages. ISBN: 978-1939621108. Nonfiction. It’s dogs! + art! + a wonderful story! You’ll laugh and smile — a lot. Bunches. Bunches and Bunches. You know how standard picture books are usually only around 32 pages? Not this one! 140 glorious pages of picture book with 67 paintings. That’s like almost (but not quite) reading five picture books about dogs. The physical book has a nice weight, texture, and color. It is very satisfying to hold. The physical book is so beautiful that you could even use it as a decorative item. You only have to bring one picture book with you to bed when you read this one to your loved ones as a bedtime story. It’s great — it looks like a long picture book. And it is! And yet, the narrative is elegant and simple to read. Which means: you get the satisfaction of having read a long picture book without the exhaustion. You know how you like to look at the cover of The New Yorker? Or The Atlantic Monthly? Or The Washington Post Magazine? There’s always something clever or poignant, right? This book is like looking at 67 wonderful covers in one sitting. It’s an excellent way to sit down and talk with your child about why or why not you’re getting a dog. This book shows a lot of different facets about dogs and having a dog join the family. Everyone loves this book! Even the baby, when he saw the book, started doing the baby sign for dog, climbed up on the couch, and then started looking through it. It’s such a sweet and fun book! Really, you’ll love it! After reading this book, I’m now a huge fan of his work! I definitely want to read this. Those illos are great. Excellent review tempting us to add it to our already groaning bookshelves. Such wonderful and confident artwork too. Our studio though is home to 5 cats so not sure they would agree with the theme of the book. Can you recommend a similar cat related book? Or mouse? We have a cat and she seems to tolerate the fact that we read dog books pretty well. I have a list of our five favorite cat books here. I’m definitely going to keep an eye out for a cat book that can parallel this dog book. There’s one book I’m working on reviewing called Neo the Cool Cat that is a wonderful ode to a most beloved cat. Hrm. Now I feel like I’m missing something — let me see what else I can find. Oh my goodness, 140 gorgeous pages!! Is this a tad more expensive than most picture books?